Earlier this week the Minister for Social Development, Ruth Dyson, was reported as being "unconcerned" about the large increase in young people on sickness and invalid benefits, saying the overall increase was "hardly a change at all". Welfare commentator Lindsay Mitchell today offered to help the Minister put the statistics for young people in context. "At the end of October there were 1,250 16-17 year-olds receiving an invalid or sickness benefit. In the United Kingdom, also experiencing a huge problem with dependency on incapacity benefits, there were 6,600 16-17 year-olds on the equivalent benefits." "The population of the United Kingdom is 15 times greater than New Zealand's yet they have only 5 times as many 16-17 year-olds receiving an incapacity benefit. This difference should alert the Minister to a problem urgently warranting concern - not indifference or complacency." Minto and "myths about poverty"
The US has the highest levels of poverty in the Western world (more than 30 million) despite one of the highest per capita incomes in the world. Why would this be? Poverty in the US is relative poverty. The US has a very high number because it has a very large population. 30 million is around 1 in 10. One way to measure relative poverty is to base it on average median income, draw the line at half and count those falling beneath it. This report tells us that using that method 1 in 10 Australians is also living in poverty. Another way of measuring relative poverty is based on calculating average household income (usually equivalised for size of family), drawing a line at 50 or 60 percent and counting every household that falls beneath that line. According to MSD, the proportion of New Zealanders living in families with incomes less than 60% of the median income, adjusted for family size, housing costs and inflation since 1998, has fallen from 22% in 2001 to 19% in 2004. At 50 percent the number falls to around one in ten also. Last year in the US the increase in income of the top 1 per cent of income earners was greater than the entire income of the bottom 20 per cent of the population. What this staggering statistic means is that the bottom 20 per cent of US citizens, all of whom live in poverty, could have had their incomes doubled if the wealthiest 1 per cent had simply forgone an increase in income last year. That's not an answer. It's a tired clapped out leftist assertion. The poor are poor because the rich are rich and if money was taken off the rich and given to the poor, then the poor wouldn't be poor any more. Ah yes. We've seen how successfully that theory works in practice. As Minto acknowledges, the US has the highest incomes per capita in the world. Their relative poor are the relative rich by third world standards. Their relative poor are richer than New Zealand's relative poor. The US is a much richer country than New Zealand. That's because too many New Zealanders have spent too much time listening to and believing fallacies promoted by the likes of Minto. "(Mike) Moore has no excuse for peddling more myths about poverty." The mother of murdered Wanganui toddler Jhia Te Tua says she plans to leave the country to start a new life with her new baby boy. Ria Gardiner will leave behind her Black Power partner Josh Te Tua, who says he sees no other option but return to Wanganui and avenge his daughter, who was killed during a drive-by gang shooting last year. Te Tua has been undergoing counselling in the wake of his daughter’s death, but his anger at the 12 men charged over Jhia’s murder remains deeply entrenched. The 22-year-old says revenge is inevitable and no plans to return to Wanganui and the Black Power. While the 12 charged over Jhia’s death face a depositions hearing in Wellington next month, Te Tua himself will also be before the courts in Wanganui for an unrelated incident. He, along with three associates, is charged with using a firearm against police and could face jail. Jia Gardiner says she is awaiting her baby boy’s birth certificate and then plans a new life in Australia with family, away from the conflict. More like it's the excitement thing. Exacting utu is more exciting than being a dad caring for his son. Pathetic and very sad. Here are two comments from Maori Party co-leader Pita Sharples. 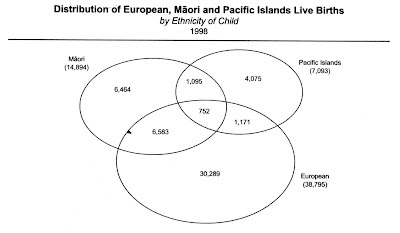 “Labour must be held to account for successive Ministers, and their own Families Commission, lacking the political courage to face up to the findings of their own research – research which proves what we in the Maori Party have been consistently saying, that beneficiary children and families are getting a rough deal due to lack of support and inadequate income”. Can you tell me, from these two comments, does the Maori Party want more or less welfare? Since the gang killing of a 2 year-old in Wanganui, the city's reported crime has dropped 4 percent. "...Police were boosted by the arrests. There were more than 60 arrests [of gang members and associates] during the inquiry, which has had a big impact on gangs' local offending. But crime not associated with gangs goes on." "...And despite international media attention stirring images of Wanganui being a troubled city on the brink of a gang war, reported crime in the city dropped by 4 per cent from the shooting until November last year." The shooting happened in May so in the following 6 months, when the police activity was at its most intense, reported crime dropped only 4 percent. Mr MacLeod [area commander inspector] said reported crime always dropped when there were extra police in a city for a major inquiry. "It goes against the argument that extra numbers don't make a difference - well, it does." Not much though. Hard to make an economic argument for extra numbers based on that result. Either the gangs weren't responsible for a large chunk of the crime in the first place, or when the police were otherwise occupied, other crime increased. And of course if I fail to mention it someone else will. This is only 'reported' crime. The vast majority of violent victimisation goes unreported. Paul Blair, beneficiary advocate, who forced the Ministry of Social Development to change the rules so parents with split custody of children could both claim the DPB, (a complete corruption of the original intent of this benefit) wrote a report. It was based on a sample of 15 DPB recipients who he was already providing advocacy work for. He got the Families Commission to pay for the research but then they wouldn't publish it. It appears he has now paid for the publication himself. The findings? "It was felt that Work and Income was not forthcoming enough with extra assistance that might alleviate poverty and facilitate genuine personal and family development," the report said. "On the whole, sole-parent DPB recipients felt that an emphasis on paid employment as the ultimate outcome ignored and devalued the work they were currently engaged in (as parents)." What a bunch of whingers. There is some discussion at Kiwiblog regarding the reasons why the number of people on incapacity benefits is growing. One commentor says Judith Collins should know what the breakdown of incapacity according to age etc is, due to the written questions she has asked. How glib. Questions are NOT ANSWERED. 11954 (2007). 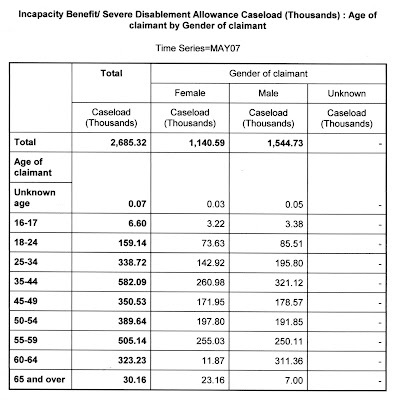 Judith Collins to the Minister for Social Development and Employment (06 Jul 2007): Further to the answer to question for written answer 8800 (2007) what is the age breakdown, by year, of all recipients of the Sickness Benefit who have received that benefit for more than 12 months, listed by incapacity? Hon David Benson-Pope (Minister for Social Development and Employment) replied: I refer the Member to the quarterly benefit factsheets, which are publicly available on the Ministry’s website, www.msd.govt.nz. The factsheets DO NOT provide this information. I am unaware of any age specific breakdown but the tables below (left click to enlarge) clearly show where the growth areas are overall. For both benefits the largest increases are for psychological or psychiatric conditions. Why do some people persist with separatism as a principle for policy formation? Why do we have a party based on race? Isn't the above the best news about race relations in New Zealand? Good on National MP Judith Collins for pointing out that the number of young people on sickness and invalid's benefits has substantially increased under Labour. To add weight to her argument, that this is a new trend under Labour, the number of Invalid Benefits paid to 15-19 year-olds in 1990 was 1,923 - just 11 fewer than in 2000. In 1990 there were 1,889 15-19 year-olds receiving a sickness benefit. The number had dropped to 1,077 by 2000. Conclusion: National has a better record than Labour in respect to the number of young people on incapacity benefits. Social Development and Employment Minister Ruth Dyson was not concerned about the figures, saying the overall increase was "hardly a change at all". How can she justify that? In 2001 there were 265,281 15-19 year-olds - by 2006 300,198 15-19 year-olds (Census counts). That's a 13 percent rise over roughly the same period. Yet the growth in 15-19 year-olds on either a sickness or invalid benefit is 65 percent. Can anybody else have a shot at explaining her response? I read Bill Ralston's column today with a sense of bemusement. He chose the two things I had used to highlight how National are fiddling, to highlight where money could be saved for taxcuts. The $45,000 on TVs for prisoners and the $761 million of beneficiary debt. This is the same Bill Ralston that used to host radio talkback. I well remember one day trying to start a conversation about how a welfare culture leads to crime. He made a sarcastic rejoinder that perhaps beneficiaries were committing crime because they weren't paid enough, and cut me off. Another fact that should make Helen Clark think twice about her handout strategy is the debt mountain in the Ministry of Social Development. More than 500 people are now employed by the MSD to try to control the $761 million of beneficiary debt. While it must be hard, at times, to get blood out of a stone, you do have to wonder about the competence of the MSD in failing so abysmally to manage its own affairs. Here's a thought - that $761 million, if recovered, would make a nice start in tax cuts for people who work for a living. Now there's a change in tune. Apart from which, I am unsure how the $761 million, which is mostly being repaid through further benefit reductions, can be used for tax cuts. But then I am not an economist.